So lets Commission a painting! Commissioning an original painting of a family member, loved one, pet or even car, is one of the most fulfilling parts of my work, these commissioned painting are so personal to you that each one is a great joy, surprise and challenge for me.... I love em' ... How to commission a pop art painting is laid out below.. enjoy. How does it work? Well it's really easy! 1. Drop me an email about the painting you have in mind. If it's a personal commission e.g painting of your children, email through a few photographs, or if it's a band , actor etc email through some of your favourite photos or ask me to look on the web for good ones that I think will work well as a painting. 2. I'll have a play around with the photos, do a few sketches and think about the style and canvas size that might look best. 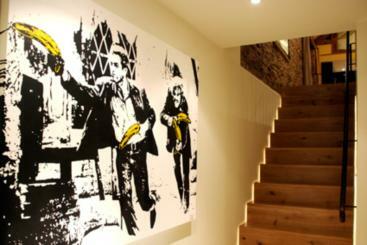 There are five main pop art styles and a range of canvas sizes. If you prefer one the styles or a particular size canvas let me now in the email, see below for the various styles and sizes. Variations of styles - of course this is art and really anything goes (that looks good!). A common mix is to add splashes of colour to other styles, add abstraction, texture etc paintings like the Show Girls series and The Farm are mixes of the above. We will discuss all of this when designing the commissioned painting.... whatever looks good we will do! 5ft x 4ft. Please be aware that size is constrained by delivery companies and the delivery destination. The size is really up to you, some paintings will need a thinner canvas or a wider one, but we can discuss all this while working on the painting together. See the diagram below to help you with your decision. And that's it, once we have talked through all the ideas for the painting I will give you a quote and get the art underway, keeping you up-to-date with it's progress via photographs. Once the painting is finished I will send you a photo of it to make sure you are happy with it and then get it wrapped and sent. Doing these bespoke commissions for you really are a pleasure. The fact that you guys put your trust in me to paint your family, your loved ones, your pets, really is amazing ... and I put my all into every painting. I hope to paint a commission for all of you soon. Below are a few examples of bespoke portrait commissions I have done. Click on the thumbnail to see the final painting along with the reference photos I used. Enjoy!